After completing his Fashion Degree at London’s Central St Martin’s and a three-year stint as Designer working with Martin Margiela on his Artisanal and Knitwear Collections, Lutz launched his eponymous Label in Paris with partner David Ballu. A twice winner of the ANDAM Award, the biggest Fashion Prize in France, and the Ackermann Pret-a-Porter Prize at GWAND in Lucerne, Switzerland, Lutz’ approach has been described as « Decontextualisation »: taking things out of context, reinventing ways to wear a classic wardrobe, working on structure, volume and identity. A trenchcoat is draped to turn into a dress, vice versa a dress is cut in heavy cotton to be worn as a coat. Knits and Sweatshirts turn into outerwear, and a towel becomes an eveningdress. 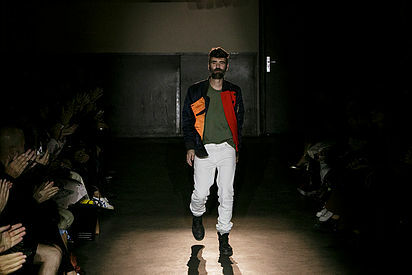 His way of mixing and matching different genres and types of garments – Sportswear and Evening, Casual and Formal, Feminine and Masculine turned out to be prophetic – it has since become an integral part of the fashion landscape. Lutz has been a consultultant at MaxMara Fashion Group since 2000, and is a visiting Tutor on the Central St Martin’s MA in London and the Ecole de la Chambre Syndicale in Paris.